Evolution of Data Structures and exponential growth of data, produced by people and businesses drove the evolution of technologies for data analysis. In my lifespan we went from megabyte-sized datasets to petabytes of so called “Big Data”. Big Data cannot be comprehended by any user without proper Data Visualization. (If you wish to see the Diagram above in full size, just click on image above). 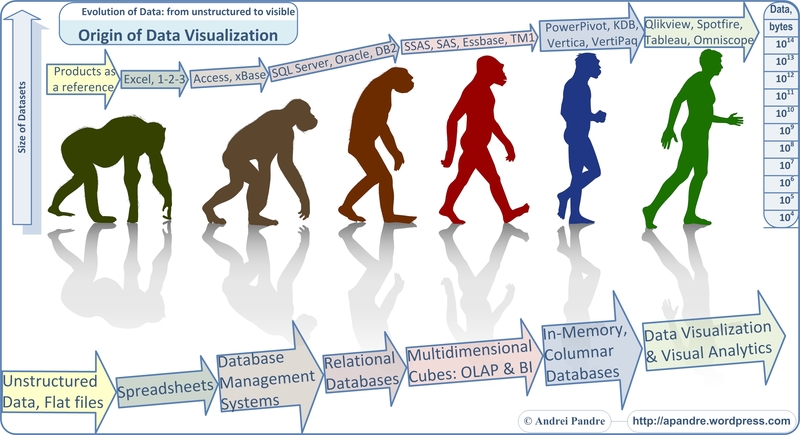 In addition to the growth of datasets, during last half of century we moved from Unstructured Data and Flat files to Spreadsheets to Database Management Systems to Relational Databases and then to first versions of Analytical Data Structures, like Multidimensional Cubes, Columnar and In-Memory Databases and so forth. Such advanced Data Structures, as well as cheap RAM, fast modern CPUs and GPUs and multi-MegaPixel and multi-Screen Displays made it possible to create the interactive Visualizations of Data of any size and created new and very popular technology we know now as Data Visualization (on this site I often use the abbreviation DV for it). I can easily imagine how Steve Jobs will say “The Magical and Revolutionary DV”, but I prefer the proven term Evolution for Data Visualization context over marketing BS.